This week is week two of #cyberPD, a virtual book study group. The group is reading and discussing Dynamic Teaching for Deeper Reading: Shifting to a Problem-Based Approach by Vicki Vinton. You can find out more information about #cyberPD here. 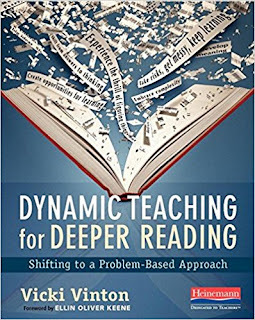 This week, #cyberpd is reading and discussing chapters five and six of Dynamic Teaching for Deeper Reading. Section One of the book focused on the theoretical foundation and beliefs that are the basis of practices that involve teaching reading as problem-solving. Section Two of the book offers practical strategies and examples of what a problem-based approach looks like in action. Chapters five and six show that it is possible to create instructional opportunities for students that are grounded in the belief that students should be involved in authentic and meaningful reading. 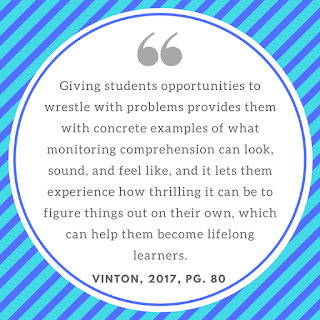 The core practices and teaching examples that Vinton includes in the book also show that teacher decision-making plays a big role in students' reading instruction. The teaching of reading is complex because our students are all unique and vary in their abilities, ideas, and life experiences. There is no script to follow, so we need to know the students in front of us, know our beliefs about reading instruction, and know what it means to engage in the reading process. Reading instruction must support student independence. In the examples of small group reading sessions that Vinton provides, students are engaged in reading or listening, talking, thinking, and figuring out problems that arise in a text. Students are doing the work, students are doing the learning. The open-ended questions that Vinton poses to students serve to build students understanding that they are responsible for doing the thinking work of reading. In a problem-solving approach, the teacher is a facilitator of student learning. In Vinton's examples students are given opportunities to turn and talk and to share their ideas. The teacher facilitates this sharing and meaning-making by probing students to think more deeply with questions such as, "How did you figure that out?" The teaching examples in the book, underscore the importance of teacher language. Language should show that students' ideas are honored and there is no one right answer. Our language can help open students' minds to the deep thinking we want them to do and create an environment in which they are willing to take risks in their thinking and sharing. A problem-based approach to reading truly builds on students' strengths. Rather than model for students and then see what they can do, a problem-based approach involves letting students think first and show what they know. The teacher's role becomes one of noticing and naming what students have done. This reversal of the gradual release of responsibility, allows teachers to build on students' strengths, but also helps to immerse and engage them in the complex work of reading. I choose this quote as a favorite this week because it speaks to student independence and, also, to the joy of reading. If we don't let students wrestle with text while they are sitting in front of us, at our reading table with books in their hand, we are lessening the chances that they will persevere when reading on their own, during independent reading time and at home, when we are not there to swoop in and rescue them. The joy of reading is not in someone telling us what to think about a text, it's in the thinking that we do for ourselves as we read, it's in the interaction between the words on the page and the ideas in our minds, it's in the connections we make between what's in the pages of a book and what's in our hearts. We need to move out of students way a bit and let them experience this for themselves. This quote: "We need to move out of students way a bit and let them experience this for themselves." captures much of the learning in this section of the book. Thank you for your thoughts. I also love the format of your post - takeaways and quote. I may try this! So much learning to synthesize and I'm having trouble narrowing down how to capture it all! Love your takeaways and your quote. It is fascinating to see what others take from this text. I look forward to learning more from you! Hi Lisa. I really like the way you expressed this idea: "The joy of reading is not in someone telling us what to think about a text, it's in the thinking that we do for ourselves as we read, it's in the interaction between the words on the page and the ideas in our minds, it's in the connections we make between what's in the pages of a book and what's in our hearts. We need to move out of students way a bit and let them experience this for themselves." It really rings true.